In this installment of In Case You Missed Seminar, we'll look over the latest research from Dr. Ryan C. Bailey's group at the University of Illinois at Urbana-Champaign. Dr. Bailey and his group care about developing new biomaterials to aid in the separation and analysis of heterogeneous tissue samples, meaning samples composed of many different kinds of cells in varying disease states. If successful, the materials developed in his lab could allow clinicians to crank a lot more information out of simple measurements while diagnosing a wide range of diseases, in addition to being useful tools in further fundamental scientific studies. Mesenchymal stem cells ("adult" stem cells) are promising research targets in the world of biomedicine. They can be harvested safely from umbilical cord blood, amniotic fluid, and a long list of other places in the adult body as well. Compared to embryonic stem cells, which are harvested from growing embryos in a process that usually destroys the embryo, the ethical issues surrounding mesenchymal stem cells are greatly reduced. However, an important term in stem cell research is "potency." The most potent cells, called pluripotent, can be chemically coaxed to turn into any tissue that exists in the human body through a process called differentiation. Embryonic stem cells are pluripotent. Mesenchymal stem cells (MSCs), on the other hand, are only multipotent, which means that they can be forced to differentiate into only a handful of cell types. Scientists are determining just how potent MSCs can be and are working out methods of inducing desired differentiations. One surprising factor that appears to influence the differentiation of MSCs is the stiffness of the surface, or "matrix," on which they are growing. Researchers have shown that, when chemical signaling molecules responsible for starting cell differentiation are immobilized on various solid supports, the responses of MSCs to the signaling molecules are different depending on the mechanical stiffness of the supports (see here and here, $). So what does that mean? Well, it's a little like telling your son or daughter you want them to be a doctor when they grow up. The words that you say are important, just like the signaling molecule. But when and where you let that expectation known can help butter your kid up for a more favorable response. The environment that a stem cell experiences while interacting with signaling molecules seems to matter in an analogous way. 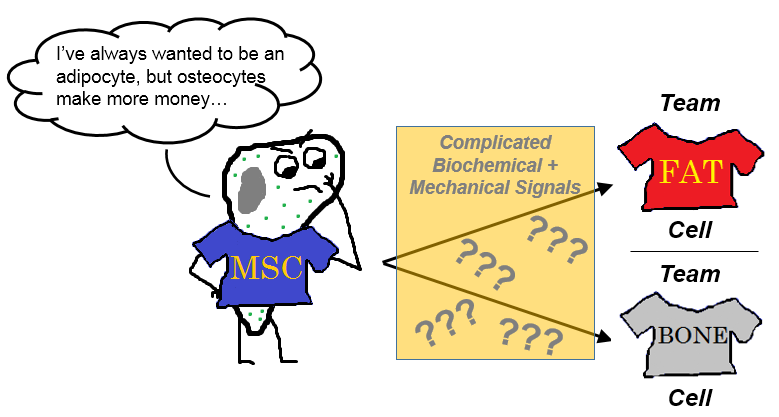 A mesenchymal stem cell contemplates the future. Published in the journal Biomaterials (Elsevier), the most recent publication from Dr. Bailey's group (first authors: Jessica M. Banks and Laura C. Mozdzen) examines the effects of two variables on the behavior of MSCs: matrix stiffness and amount of signaling molecule present. A specific method of synthesis developed in Dr. Bailey's group allows the researchers to control the stiffness of the matrix independently from the concentration of signaling molecules, a key advantage which is not possible through other methods of synthesizing these kinds of biomaterials. The matrix is synthesized with a desired stiffness in one step without any signaling molecules incorporated. Then, a separate chemical step is used to incorporate signaling molecules. Two flavors of signaling molecule are attached to the biomaterials: BMP-2 (bone morphogenetic protein 2), which encourages undifferentiated MSCs to turn into bone cells (osteocytes), and PDGF-BB (platelet-derived growth factor BB), which signals MSCs to grow and divide (proliferation). The authors quantify the proliferation for cells growing on each kind of biomaterial. The biochemical activity for each group of cells is also quantified by measuring how much of five different genes the cells express. Two genes in particular are contrasted: ALP (alkaline phosphatase) and PPARG (peroxisome proliferator-activated receptor gamma). When undifferentiated MSCs are expressing a high amount of ALP, they are likely to become osteocytes; when MSCs are expressing a high amount of PPARG, they are becoming adipocytes (fat cells). By measuring the differences in gene expression, the researchers get clues as to how the cells will eventually differentiate. The findings were a little surprising. The researchers found that the presence or absence of BMP-2, the signal for MSCs to become osteocytes, did not have a very profound effect on the biochemical activity of the MSCs. The matrix stiffness played a much more dominant role in influencing the MSCs to become osteocytes, even in the complete absence of BMP-2. Conversely, when less stiff matrices were used in the experiments, the MSCs displayed biochemical activity more similar to adipocytes - again, even in the presence of BMP-2. Well, nobody really knows. The relationship between stem cell differentiation and matrix stiffness is still a new observation, and several groups are working together to try to figure out why cells care about the mechanical properties of their environment when there are chemical cues floating around to tell them what to do. The measured effects are significant enough to warrant further investigation, so further investigation there shall be. The authors are quick to point out some limitations of their study. First, they acknowledge that the range of BMP-2 concentrations they used was not exhaustively wide, and they are still exploring how BMP-2 can be incorporated into the biomaterial scaffold that they have built. Testing a wider range of BMP-2 loading and matrix stiffness will help to strengthen their conclusions. Secondly, the authors point out that the materials used in the study were only two-dimensional. Repeating the experiments on a three-dimensional biomaterial scaffold will more accurately replicate the environment for developing MCSs and in turn allow researchers to more accurately describe the factors that influence differentiations in real biological systems. Dr. Bailey's most recent paper highlights only one facet of the potential applications for the types of biomaterials he and his group are developing. Boosting stem cell research is exciting, but certainly not the only application for their research. Spatially sensitive chemical scaffolds could find applications in the fields of clinical medicine and biological analysis. They could also be used as tools by future generations of scientific researchers looking to easily separate complex groups of cells or establish greater control over their behavior. Dr. Bailey's research is an example that shows that science is a tool-driven process. The science behind developing experimental tools is just as exciting as the research that the perfected tools will produce.